Growing Swiss Chard is very easy. Swiss Chard tolerates poor soil and does well with benign neglect, and withstands frost and mild freezes. Both the stalk and the leaves can be eaten. The leaves can be used in salads or cooked like spinach. Swiss Chard is a member of the beet family, without a bulb. Not susceptible to disease problems. 'Fordhook Giant' - Compact plants with thick, dark-green, savoyed leaves with white veins and broad, white stems. 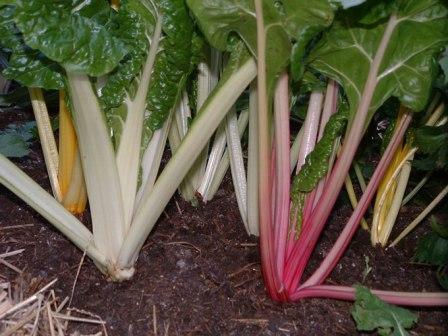 'Rhubarb Chard' - Red-veined, heavily savoyed, green leaves with deep purple-crimson stalks. 'Verte a Carde Blanche' - Large, green, slightly blistered and savoyed leaves with wide, white ribs. 'Verde da Taglio' - Italian chard. 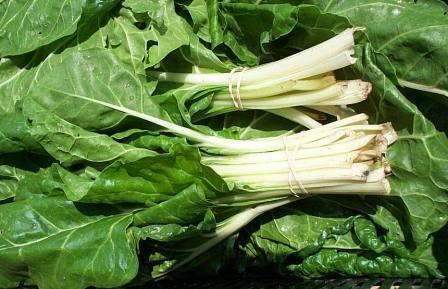 Plants produce thin stems and smooth leaves with mild spinach flavor. 'Bright Lights' - 20-inch plants with dark-green, bronzed, moderately savoyed leaves with stems, midribs and secondary veins showing gold, yellow, orange, and pink intermediate pastels and stripes.